2, Wifi control box power supply. 3, open the phone settings, search wifi: "LEDnetXXXXXX" and connect. 4, open the "Magic Home" APP, connect the appropriate equipment. 1, before the paste, please remove the paste position of the dust and watermark. If the LED strip is not suitable for use in some places, please use our free tape or fixed plywood, will be very strong. 2, when you do not use the remote control, please remove the battery, or use the isolation chip to separate the battery and circuit board, so as to avoid battery consumption, affecting the normal use. 3, if you need DIY, you can contact me, I will be through a professional approach to guide you the correct operation. 4, use any questions, please contact me, I will reply within 24 hours of your information and solve the problem. 【Durable】In order to solve the problem of high temperature when LED Strip Lights outdoor works,we have made 5m super viscous tape and 10 sets of LED strip fixed deck.These two kinds of fixed accessories can be used in different scenes, such as TV,computer,wall,wardrobe, bedside.Anything you want to decorate, will be very beautiful. 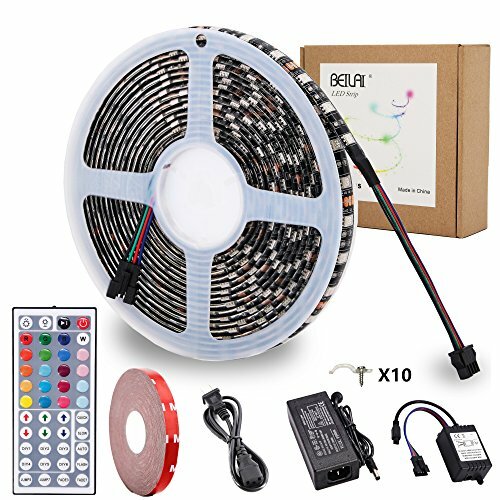 【Easy to install and use】LED Strip Light,just Plug-and-play, no need to use wiring . It consists of 4pin JST-SM connector, the controller and LED strip .They will be connected tightly and need to separate lamps when they unlock . Compared with the 4-hole ordinary connector, 4pin JST-SM connector is more convenient and safer to be used in home, restaurants, KTV and other living areas. 【Multiple colors】SMD 5050 RGB LED Strip Lights can bring multiple changes to lights. Use the remote control to change it to white or different colors. The lights can also be changed to over 100 different fading modes and speed with your preferences. 44-key IR controller with 6 DIY keys, used to remember your favorite color. If you have any questions about this product by BEILAI, contact us by completing and submitting the form below. If you are looking for a specif part number, please include it with your message.